Bathroom Vanities and Accessories Design and Tips | DecorPlanet.com Blog: Toilets in the media! Toilets aren't in the news that much. As intimate objects, there's only so much they're capable of doing that reporters and information aggregators would consider newsworthy. Nonetheless, these cornerstones of every great bathroom do occasionally find their way into the news. Take for instances an essay recently published in the Orlando Sentinel. Staff photographer Gary W. Green wrote about an instance in which, shortly after the paper brought home an American Society of Newspaper Editor's Freedom Forum/ASNE Award for Distinguished Writing on Diversity award, he was sent on an assignment to photograph the Comfort House of Orlando - which specializes in portable toilets. While he was initially a bit downtrodden about going from having a glamorous day to getting what he initially considered a less-than-favorable assignment, his attitude changed when he was struck with the visual versatility and surprising appeal of the port-o-johns. He ended up taking 400 pictures of toilets, and it seems like he might be quite proud of one shot in particular - a row of green portable toilets. He notes that he probably would've been too headstrong early in his career to appreciate the assignment, but it seems the beauty of toilets won him over. "Before I knew it, I was lost in a world of beautiful light, repeating patterns of toilets, reflecting water and mist, and all the access I could ever want with subjects oblivious to my presence," wrote Green, who also works as an editor and multimedia producer at the Sentinel. Meanwhile in Maryland, the senseless destruction of a pair of portable toilets led to the equally senseless destruction of an 87-foot-tall oak Swamp White Oak - which the Baltimore Brew describes as a "Maryland Champion in its day." The source continues to explain that the mutual annihilation of the tree and the toilets occurred following a soccer game on August afternoon in 2010, and the details of the situation were explained in a blog called "Friends of Herring Run Parks." 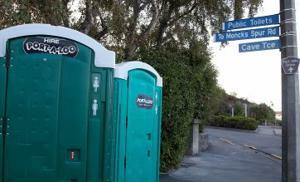 Apparently, after the soccer game, hot coals were thrown away into one of the portable toilets near the tree. In hindsight, this was a terrible idea. The coals combined with the substances in the toilets and created a substantial fire. By the time the local emergency workers could douse the flames, the nearby tree was too burnt up to be salvaged. Let this be a lesson to all of us - It might be a bad idea to dispose of flammable objects in portable toilets.